There is much good evidence about the need for, and effectiveness of, all-through schools.Suddenly they do seem to be the flavour of the decade all round the world - there are a host of reasons for this, some of which are below. In notes for setting up the UK's new Free Schools the categories today explicitly include all-through schools, saying new free schools "can be primary, secondary, middle or all-through schools" and here is the press release for one just recently approved such school, it is 4 - 19. This is a global trend, Here is a video walk round of Mark Oliphant College in South Australia, which was South Australia's first purpose built facility combining care, preschool, junior primary, primary and secondary education. An all-through school combines multiple phases of a school student's learning into one institution, with one board of governors etc. - perhaps 4 - 16, or often birth through 19 and in some cases aspirationally beyond that. My own interest is in 0 - 21, of which more elsewehre on my server. However, these are not co-located schools with seperate identities and management teams. All-through school survived and thrived in small rural areas but are now found everywhere, including some of the most challenging urban settings too. Let us start with phase break discontinuity. In short, each time children pass through an age phase change many of them drop back rather than leap forwards. Heading for half UK school children are damaged by this and this is why the UK government is currently (2012) calling for more all-through schools. Even before get to the research, this is common sense really - probably every parent knew it before the politicians did! Confident, autonomous 10 year olds who knew just where they were and what they were doing, suddenly become characterised as lost and treated by the secondary school as "new ones" who know little and are given almost no autonomy at all. Parents report the resultant behaviour changes, many reading this will recall their own misery and confusion. For a substantial number a disconnect with education is triggered by these phase change events. Hargreaves, L., & Galton, M. (Eds.) "Moving from the primary classroom: 20 years on". London: RoutledgeFalmer 2002, their graph (above) showed a significant drop-off between primary and secondary schools in children's performance in three crucial areas. Fig. 1 shows the percentage of pupils who did not make progress in absolute terms on each of the tests. Just over 45% of Year 5 pupils failed to answer as many mathematics items one year after transfer as they had done in their final term at the feeder school. 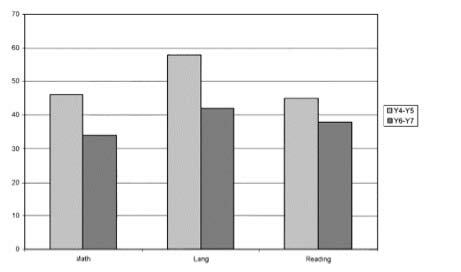 For language and reading the corresponding figures were 58% and 46%, respectively. For year 7 the hiatus was less pronounced with 34% of the pupils in mathematics, 42% in English language, and 38% in reading doing less well after transfer. For most pupils these differences were small (of the order of 3 or 4 points on a 33- item test). However, 12% of pupils at Year 5 and 7% at Year7 made significant losses of somewhere between a quarter and a third of the possible points. This is pretty depressing stuff and the discontinuity is widely observed in classrooms and families. Whilst the plural of anecdote is not data, the same story is heard over and over to add credence to the research. Initially the view seemed to be that this was a scale issue - social changes resulting from the loss of mutuality and familiarity of a smaller school stood in the way of learning as children moved to the less personal, more anomymous scale of the larger secondary school. Later work however suggests that it is changes in teaching approach rather than the social changes from scale. "The study of the transfer of pupils from primary to secondary schools in England and Wales has been a continuing pre-occupation of administrators, teachers, and researchers during the past three decades. Much of this research, however, has focused on the social adjustment of pupils to the change of school, rather than the impact of the school change on academic performance. What evidence there is on the latter issue suggests that around 40% of pupils experience a hiatus in progress during school transfer. This has been mainly attributed to a lack of curriculum continuity between the primary and secondary stages of schooling. Recent work suggests that even more important may be the variations in teaching approach and the consequent failure of pupils to take account of these differences in their efforts at learning to become "professional pupils." In a way, the reasons for the disconinuity and the resultant damage are less important than the fact of it. If walking across a motorway pedestrians get hit by a variety of vehicles it is less important to analyse just which vehicles and more important to stop crossing the motorway! Which brings us nicely to all-through schools, and their growing band of supporters. "An all-through school links the stages of education together in a shared context. This may be through collaboration, or it may be formalised through a hard federation or trust. There is growing interest in all-age schools. and organisational (shared expertise and resources). Different structures of schools and leadership emerge in response to local needs and priorities". the sense of collegiality, of mutuality (of what I like to call US-ness) that we develop in education is important for communities, economically and socially. All-through schools - becasue that sense has time to flourish because the stabikity of "family" learning groups can be so enduring, because mixed age works so well when the age span is sometimes significant - are particularly adept at building that mutuality. "These schools have a clear vision of their role within the local community, within Scotland and, often, within a global context. Inspectors have ￼found that young people in all-through schools are often very positive about their experiences. They value the strong caring ethos and supportive relationships which many all-through schools exemplify." Of course in these money strapped times the consistent pedagogy of the Cambridge research and the NCSL list could also be extended to embrace efficiency savings: a single leadership team, school office, economies of scale from FF&E to food, and more.etc. For certain some all-through schools are built from federation for these reasons. A huge gain is the professional development cross over between previously seperate phases. One surprise when schools go all-through is often how many have, or seek, experience outside of their recognised age range. In particular the importance of playfulness at primary level often gets forgotten in secondary; in all-through schools it is a lot less likely to be forgotten, or lost. And there are elements of secondary - for example language teaching, that carry well down the age range. Certainly, in work on effective FF&E in schools, secondary age students seem better engaged and work better with the colours, soft floors, shoes-off and relaxed seating more common to primary schools. When the staff encompasses a wide age range, the ability to learn from each other is enhanced, and affordably. But the gains run well beyond that. All-through schooling offers the opportunity for some mixed age work too, stage not age and learner mentoring. 15 years ago in a research project at Ultralab, we asked a lot of learning organisations about things like scale and organisation. At the time the headline news was that the orchestras, scout troops, Brownies, church groups and so on all said that if their numbers fell too low they would have to cease ("because I'd have to do it all myself and that would be impossible - I need enough members to share the tasks" - as one said). And they would have closed with numbers somewhere below 20, while schools were at that time (before Superclasses) aspiring to class sizes below 20! But beyond the 1990s headlines, a significant part of the feedback we observed was that with a mixed age cohort the youngsters chased after the role model of the older students, who in turn reinforced their own understanding by having to re-present what they knew to the younger ones. There are behaviour gains too. As a serially naughty teenager in one of our Kent school visits commentd: "It is really hard to be naughty when you are looking after an 8 year old" Time and time again secondary teachers report their amazement at the maturity of their children when they are engaged in mixed age learning - for example on a shared visit outside school, but even in the behaviour in 2 - 18 year old playgrounds where everyone always fears the worst, and then are amazed at what they find happens to behaviours. The groundbreaking 1993 - 2000 Learning in the New Millenium longitudinal research project, led by Carole Chapman was also mixed-age - here is a video summary of its interim findings. So, the short version of the all above is: all-through schools work. Which certainly helps explain their current über cool status!